When you retire and you are vested in your pension plan, you will have to choose how you want to receive your pension benefits. If you choose a life-only annuity payout from your pension plan it means when you die, the income stops. If you are married, and you both rely on this pension annuity income, this will leave your spouse in a lousy financial situation. To avoid this situation, you may want to choose a joint life pension payout. You will want to carefully study the numerous distribution plan choices that your pension benefit plan offers and find the one that fits your joint financial needs. Below is a real-life example of one woman’s pension benefit distribution choices. If Sara chooses the single life option she will receive $1,741 for as long as she lives. The monthly pension benefit will stop when she dies, so if she lives only one year, no additional funds will be paid out. If she is married, her spouse will not receive a survivor benefit. If Sara chooses the 50% Joint and Survivor option, she will receive $1,560 per month, and upon her death, her spouse would receive $780 per month as long as he lives. If Sara chooses the 100% Joint and Survivor option, she and her spouse will receive $1,414 per month for as long as either of them is still alive. With this option, Sara is taking $327 less a month than the single life option. This $327 per month reduction in benefit is essentially buying life insurance for her spouse so he will continue to have income upon her death. To compare alternatives, Sara could see how much life insurance $327 a month would buy. If Sara chooses the life with 10 years certain option, a payment of $1,620 per month is guaranteed to be paid out for a minimum of ten years and would continue as long as Sara was alive. This means if Sara passes away after one year, the payments would continue to a spouse or beneficiary through year ten as measured from the first payment. If Sara lives for thirty years, the payments continue as long as she is alive. Sara could also choose a lump sum of $256,660 instead of one of the annuity options. Sara wants to make sure her spouse has income upon her death, so she knows she will not take the single life option. 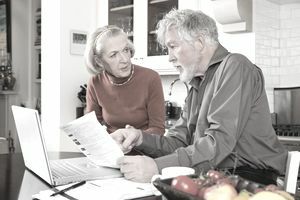 If she is in good health and insurable, Sara may want to get life insurance quotes to compare the monthly cost of using the pension to provide a benefit to her spouse versus the cost of purchasing her own outside life insurance. I see this recommended most often by financial representatives who are compensated for the sale of life insurance products. If Sara does look into life insurance she may want to get life insurance quotes online, talk to a life insurance agent, or use the services of a fee-only life insurance agent, or fee-only financial advisor. If Sara chooses to work with an agent, it is important for her to remember that the agent may not provide an objective analysis as he/she will only be paid if Sara buys the life insurance. Sara will also want to weigh out the pros and cons of taking a lump sum distribution versus taking her pension as an annuity. Sara should also consider her and her spouse's life expectancy when making a final decision. If her spouse were considerably older than her a period-certain annuity payout may make more sense than a joint life payout. Retiring From the Military? Here's Some Things to Know! How Much in Taxes Should I Withhold From My Pension?